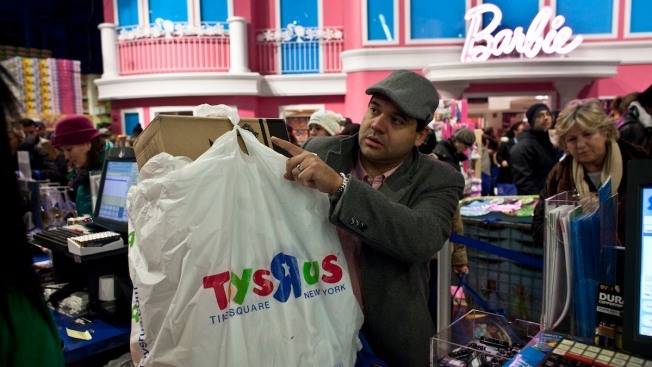 This Nov. 28, 2013, file photo shows a costumer paying for his items at Toys R Us in Times Square in New York City. The company based in Wayne, New Jersey, said late Monday that it was voluntarily seeking relief through the U.S. Bankruptcy Court for the Eastern District of Virginia in Richmond — and that its Canadian subsidiary would be seeking similar protection through a Canadian court in Ontario as it seeks to reorganize. Toys R Us said court-supervised proceedings will help restructure its debts and set the stage for long-term growth. Its announcement said separate operations outside the U.S. and Canada are not part of the filings. And it emphasized that its stores worldwide will remain open and that it will continue to work with suppliers and sell merchandise. "The company's approximately 1,600 Toys R Us and Babies R Us stores around the world — the vast majority of which are profitable — are continuing to operate as usual," the company statement said. "Customers can also continue to shop for the toy and baby products they are looking for online." The move comes at a critical time ahead of the peak holiday shopping season that is crucial to retailers' bottom lines. Brandon expressed confidence in the looming reorganization, vowing that the iconic Toys R Us and Babies R Us brands known to shoppers for generations would continue on. Toys R Us, a major force in toy retailing in the 1980s and early 1990s, started losing shoppers to discounters like Walmart and Target and then to Amazon. The company has struggled with debt since private-equity firms Bain Capital, KKR & Co. and Vornado Realty Trust took it private in a $6.6 billion leveraged buyout in 2005. The plan had been to take the company public, but that never happened because of its weak financial performance. With such debt levels, Toys R Us has not had the financial flexibility to invest in its business. Analysts say Toys R Us hasn't been aggressive about building its online business, and has let those sales migrate to rivals. And they say the company should have also thought of new ways to attract more customers in its stores, such as hosting birthday parties. A Toys R Us bankruptcy filing would join a list of those from other major retailers since the beginning of the year — including shoe chain Payless Shoe Source, children's clothing chain Gymboree Corp. and the True Religion jean brand — as people shop less in stores and more online. While toy sales overall have held up fairly well, they are shifting toward discounters and online companies. U.S. toy sales rose 6 percent last year on top of a 7 percent increase in the prior year, says NPD Group Inc., a market research firm. That was the biggest increase since 1999 and was fueled by several blockbuster movies. But for the first half of 2017, sales rose 3 percent. That puts more pressure on the later part of the year, when most toy sales occur, for the industry to meet NPD's estimate for a 4.5 percent annual increase. Lego is laying off 1,400 workers after saying profits and sales dropped in the first half. And the nation's two largest toy makers, Mattel and Hasbro, reported disappointing second-quarter results. In a separate statement late Monday, the company said its online sales sites worldwide remain open for business during the court-supervised process. It added that the company's operations outside of the U.S. and Canada, including operations in Europe and Australia as well as some 255 licensed stores and joint venture partnership in Asia — all separate entities — were not part of the Chapter 11 filing or the parallel Canadian move. The company has nearly 65,000 employees worldwide and bills itself as a leading global retailer of toy and baby products. Merchandise is sold through 885 Toys R Us and Babies R Us stories in the U.S., Puerto Rico and Guam, and in more than 810 international stores and over 255 licensed stores in 38 countries and jurisdictions.